Reviews | Choice 2 Tray Bakery Display Case with Front and Rear Doors - 21" x 17" x 12"
Choice 2 Tray Bakery Display Case with Front and Rear Doors - 21" x 17" x 12"
Use this Choice 2 tray bakery display case to make sure all of your prized pastries are presented in the most tempting way! The clear acrylic construction on all sides provides excellent product visibility for a clear view of your bagels, donuts, and other sweet treats from all angles. Two clear trays are included so you can display products on different tiers, while adding height and dimension to your countertop. The sliding trays can easily be removed for quick cleaning. We display all our homemade cookies here and it’s wonderful. I’ve had about a year and it’s still beautiful! Good quality plastic. Doesn’t slide around and stays in place. What a nice 2 tray display. This one has a front and a rear door. I like the fact that I can use the rear door to load it. This is a great looking bakery case, we have it in our customer waiting room and it works and looks great! So professional, at first the inside trays would move a bit while loading, but now we've learned to handle it. Customers use tongs so tray shifting is not a problem at all. Having baked goods in a coffee shop is a must and this case displays our muffins, cookies, and brownies perfectly. Looks good, holds up well to use everyday, and is built well. We are super pleased with these display cases! They were easy to put together and look great! I would highly recommend these to anyone looking to purchase some display cases. We are happy with the bakery display case. It is exactly as described, and fit perfectly on our counter. Very clean looking and have never had a problem with it. The looks and functions great for the price. Easy to clean and the doors open wide for access. I only wish the front didn't have a handle but we removed it and the holes aren't noticeable. this is a nice bakery case. make sure you have pliers to tighten bolts when putting together. the top shelf is small opening for big hands. the door opens up. there is a 1/4 in gap at top and bottom which allows flies to get in. I put clear tape at top and bottom to keep them out. I would put this case not all the way at 4 stars, but more than just 3. It is unbeatable for its price, but its extremely delicate. I accidentally bumped it against the wall and a corner chunk of acrylic just popped out. Mind you, this was about 10 minutes after I assembled it. I would honestly think a fully glass case would be more durable. But like I said, unbeatable for the price. I would buy again (and I'd probably have to If i bump it one more time). This was a really nice display case, very easy to clean, and a great size for displaying cookies and muffins. I had an issue with how hard it was to assemble… It just seems to me that an acrylic pastry case should have assembled with a few quick snaps. This thing had teeny tiny screws, and it took me, embarrassingly, about 30 minutes to put it together. We really liked the look and price of this display case. I mean, you can't beat the price. The trays just sit on their rails though, they have fallen down many times when bumped. Could probably be taken apart and put back together with different results? This display case is used everyday in our coffee bar area. We use it as a self-serve display case for baked goods. Very functional. The only thing we don't care for is how fragile and thin the acrylic material is. The first case had a broken panel right out of the shipping box. Webstaurant was very responsive and immediately shipped a replacement. Display Case arrived in a timely manner and was packaged very well. It was lighter than I expected and the acrylic was spotless and free of fingerprints. Exactly what we needed to display our bakery items to our customers. Sales have increased with the visability of the products and the ease of our customers serving themselves. This bakery display case was very wobbly and because it is acrylic, you cannot use windex to clean it - it will make the acrylic cloudy. We ended up taking this to goodwill after using it for a few months. would not recommend. We appreciate your review, Uli! If you are looking for more information the product that you are purchasing, please contact our Customer Solutions team. Very good display case. Still using it good after almost 3 years of using. Finally get to review this case. it can be cleaned just with clothes and it will come right off. We use this display for our French macarons and have no complaints. Requires some assembly but it only takes about 10 minutes. We put some labels on the front and it allows for great viewing for customers! Happy with this buy. We use this in our coffee shop to display our muffins and scones. It works very nicely to display them and having opening from both the front and back is very handy. The top is also big enough that we can display biscotti and there is enough room in the bottom that we can place the serving plates and paper bags. A local ice cream store was wanting to offer some additional sweets and I was needing a display case to leave with them. I came across this and thought it perfect. The products on the top shelf are really close to the top. We had cupcakes in the case and occasionally the icing hit the top door when being removed from the front of the case. We ended up using only one shelf so we had to cram more product on one shelf. Top shelf might be good for cookies or if the tray could slid out part way forwards. For the price, it does it's job but I fear that it might not hold up in the long run because of the plastic material. I could be wrong. So far so good. Pros - easy to clean, easy to display, fairly sturdy sides and display trays. Cons - The actual doors tend to droop. I think it would benefit to have a magnet on top as well, or something besides a plastic hinge. I expect the hinge will be the first part to fail, because the doors sag a bit. Looks nice but is not very durable. The plastic is thin and very flimsy. Ours broke after only 2 weeks. For restaurant use, I would get one made of a heavier plastic. Thank you for the review, Dana! We're sorry this did not hold up at all. A Customer Solutions Representative will contact you shortly. While this looks nice, the front door has a major design flaw. It comes, or more specifically falls off way too easy. In the 2 months we have used this display, we have broken off both corners and now the door is unusable. Some sort of locking pins or wing nuts to hold the door in place, but still make removal easy for cleanup would be much better. I am now shopping for a different case. Thank you for the review, John! We're sorry this display case has given you issues. A Customer Solutions Representative will be contacting you about this shortly. Front door has fallen off several times, much to my customer's surprise and my embarrassment. Hard to access items on the top of the shelf due to poor design. Not terribly happy with this product. Thanks for reviewing this display case, Emily. We're sorry for any embarrassment this may have caused. A Customer Solutions Representative will contact you about this directly. My showcase is perfect for Bakery/Dessert trade show displays. I always receive compliments on how beautiful my table/booth looks with the items displayed in the showcases. Super awesome! The back doors have a magnet so they don't swing open, its a strong magnet though so you have to really pull to open it. The front door opens easily and you cant pull the tray out from the front which is nice, so no one can steal your trays. And its super easy to assemble! We use this case for cakeballs, muffins, cookies, brownies, mini bundts - you name it! The sides and top are a little thinner than other cases but you can't beat it for the price. Just take a little care with it and don't expect to stack other items on it. Awesome! this works great, front and rear doors work excellent and allows us to replenish the items from the rear while customers continue to retrieve product from the front. I will be buying more! These displays are great! Very affordable and get the job done. We use them everyday for our breakfast buffet. They are easy to clean and assemble as well. This display case was exactly what we were looking for. They have brightened up our restaurant and definitely helped to increase our pastry sales. We recommend these to anyone in need of a display case. This display case is good use for any cafe, bakery or coffee shop. It took a little time to assemble it but it worked out great. The only option I would recommend to the makers is to only make one of the sides available for opening. The kids that come in always want to open the display case. This was absolutely perfect for the café in our retirement community....Love how it opens from the back!!!! Great quality!!! Our residents just love it!!! Thank you!!! I use this to display muffins, cookies, etc. at street fair events and it looks very professional. Also very easy to remove trays and clean after each event. Wonderful display for my cupcakes! Took no time to put together and is absolutely gorgeous! Would definitely purchase again without question. Love that it opens from both the front and back. Works amazing for showcasing and a better product than I could have dreamed of for the price the only draw back at times is the front opening if you do not need it and the insides can be tough to clean unless you have smaller arms. I am very happy with my purchase. Cleaning the container is a lot easier now. The back opening of the container makes replenishing of items very convenient. It is very easy to clean, nice and clean look. We can put a lot of cookies, but can not put 2 pies on a shelf. This display case is working out especially well for the needs of our small rural bakery. It's quite attractive and gives a professional presentation. The baked goods remain fresh throughout the day. We decided on this particular display case for several reasons: 1. The front entry door allows for self service. Yet, if used at an event, the two rear doors allows me to serve the customers. 2. The size is just right to display a couple different baked goods without looking empty. 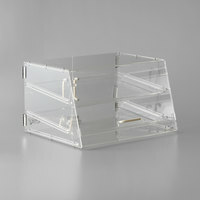 Has two clear acrylic shelves that are easily removable and wash up very nicely. 3. Its portability allows us to easily load it in the vehicle to use at an event. Being lightweight is a plus. 4. Clean lines, professional appearance. Stands out in a crowd. Would recommend this display case to any bakery selling cookies, brownies, muffins, etc. This display looks great on our hospitality station! The residents love to see the freshly baked muffins in the case! And it is attractive their visiting families. We love this display case. It is clear so that customers can see the goodies we have to offer, easy to clean and is perfect for displaying our treats in a professional, yet cost effective way. This item is extremely nice and very aesthetic. Very easy to assemble and provides ample/visible storage while not taking up too much room. Great for bakeries or restaurants wanting to offer to-go options!